Review: After stuffing us with the sweet, sweet donuts for the last year, Boca 45 sets up a new b-boy mission with these two heavy party hitters. 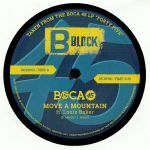 "Move A Mountain" is a real steam train of a jam with big 80s breaks and powerful vocals from Louis Baker hitting Joe Dukie levels. Flip for another floor tickler in the form of "Bryan Munich Theme". Packing a frazzled guitar-led 70s funk feel (with just a wee dash of classic 98 Bowser in the feels) we have no idea who Bryan is but we're glad he exists.